The 2014 poster is here! I am so excited to finally be sharing the poster for the 2014 Steel City Jazz Festival! The amazing artwork you see above was painted by Lester Coloma. If you have walked down James St lately you have certainly seen Lester’s work before: his mural of the Tortoise and the Hare on the side of the Tivoli theatre is an iconic part of the James St landscape. Lester enlisted his brother, Norman Coloma, to complete the design, and I think the final product speaks for itself. You can see more of Lester’s work here, and more of Norman’s work here. 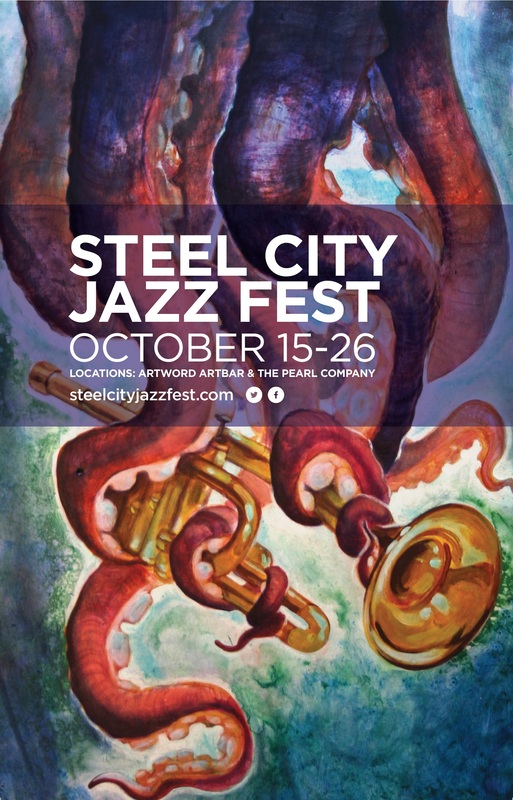 If you have a spot to put up a poster please feel free to email us at steelcityjazzfestival@gmail.com and we’ll be sure to drop one off for you! We will also be distributing postcards featuring the poster artwork and the full festival schedule. Any help spreading the word is very much appreciated! Steel City Jazz Festival The 2014 poster is here!